By David Gillingham. Here's a tasty little march in a straight-ahead style that is sure to appeal to your beginning band. 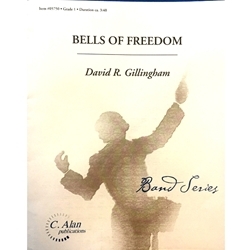 Bells of Freedom is aptly titled, too, and its patriotic feeling is enhanced by a few phrases of America. Level: very easy.